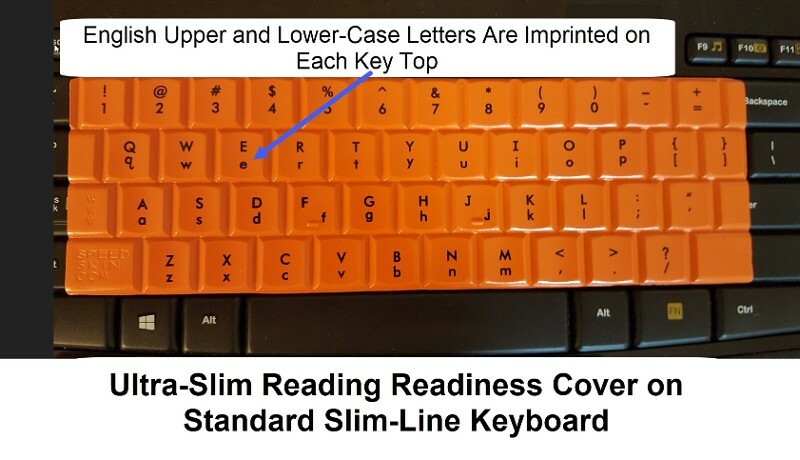 SpeedSkin’s reading readiness keyboard cover is imprinted with the English upper- and lower-case letters on each key. Therefore, they are perfect for early readers who are confused when the capital and lower-case letters are not the same (e.g., Ee, Gg, Hh, Qq, etc.) Also, ESL students and children with special needs can use help for the same reason. 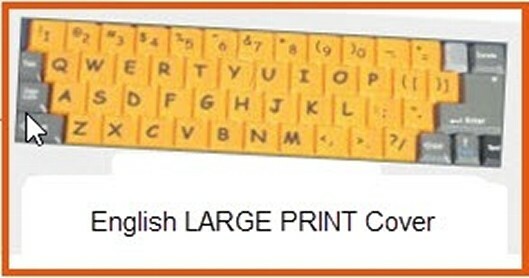 When you choose these computer keyboard covers, you will receive a durable product that provides students access to the world of technology for those who are beginning to read or need additional assistance. 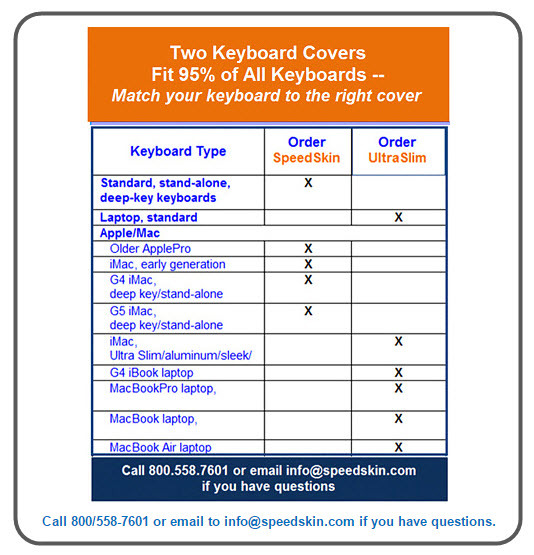 We offer a variety of purchase options and pricing for our SpeedSkin keyboard covers. If you are interested in purchasing English upper- / lower-case reading readiness covers or LARGE PRINT covers, click the Shop Now button below or call customer service at (800) 558-7601. Visually Impaired, Blind, and Manually Impaired. English, LARGE PRINT for the Visually Impaired Typist. 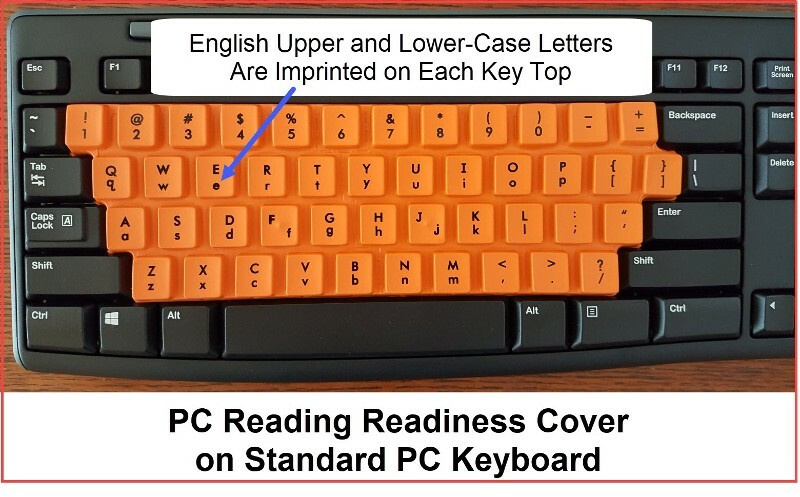 With English LARGE PRINT covers placed on the keyboard, the computer becomes instantly accessible to those with visual impairment. Take it from computer to computer – it fits all standard keyboards. English LARGE PRINT imprinted on our bright orange covers enhances the laptop keyboard in darkened areas such as on an airplane or TV room. Visit our home page to learn “the basics” as to the value of the blank SpeedSkin covers, all of which apply to the LARGE PRINT covers. Both the imprinting and the underlying polyurethane cover have been laboratory tested and certified to over 1million impacts each with no discernible wear to the cover or the lettering demonstrating excellent and long-term utility. SpeedSkin offers Dvorak layout covers for the left- and right-hand as well as the Dvorak cover for both hands to achieve the ergonomic benefit of the Dvorak layout. For instructions on how to use your foreign language cover, click the SpeedSkin Products tab > Foreign Language Layout Covers; scroll down to “How to Use Your Foreign-Language Cover”. Return to Home for ordering options / Shipping & Handling charges / Exchange and Return policies.